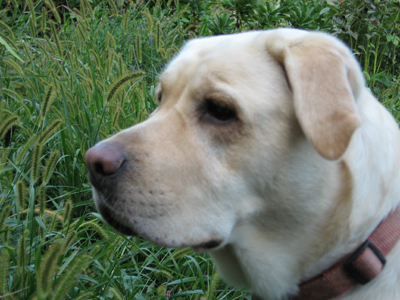 My dog and a baby rabbit, a pig, and an owl calling in the morning dark, have forever erased my “view of nature as being a fairly benign place.” And while I would tell you that MacKenzie, my beloved Labrador Retriever, is a domesticated species, she still has her retrieving instincts. Look at this face. Noble. Domesticated. Still a hunter. The garden is my solace. Yesterday morning, it was the scene of nature, in all of its contradictions: violence, survival, reality. Apparently my neglect of late, allowing the edges of the garden to become overgrown, has encouraged a mother rabbit to build a nest. MacKenzie caught a newborn rabbit. It took me many minutes to convince her to drop it. And I had to dispatch it out of mercy when she finally obeyed my command. It was a dreadful way to start the day. I went to a local farm a few weeks ago that I love to patronize, because they raise their livestock outdoors on grass. This farm produces meat that is delicious, clearly superior to what you buy in the supermarket. I buy from them and feel righteous, because I am supporting the humane raising of animals and supporting the local economy. I went that early Sunday morning to buy eggs (from genuinely free-range hens). I did not know that Sunday mornings are when slaughter takes place on the farm, and that day was “pig day.” I did not see, but I heard and the sound was indescribable. It was horrific and it went on for many minutes. I know of two farmers personally (not the folks above) that raise animals for their meat. These people are of similar minds to me, I believe, and after that last experience I plan to approach them and ask them their definition of humane slaughter, of a humane abbatoir. Will I agree with their definition after what I heard? I will let you know. After these two recent shake-ups, I was surprised at my reaction this very early morning when I went out into the dark to retrieve the newspaper. An owl was calling. I know that owls are ferocious predators. And yet its call was haunting and beautiful, and I appreciated it. How do I reconcile the natural behavior of hunters, both animal and human, and the violent way they obtain their food with my sensibilities? I eat. What shall I eat? How shall I choose what I eat? Shall I only eat plants, and animals products that we collect as partners with animals, like milk and eggs? Shall I eat meat if the animal is raised and slaughtered in a method that I can accept? I am an omnivore by nature. Shall I also be one by choice? I need to do more research, I need to recover emotionally from the last few days, I need to love my dog again, and I need to figure this out. Amy – I haven’t been keeping up with your blog since I started back to work, so thought I’d check in tonight and see what I’d missed. Isaac and Olivia had me watching episodes of “Planet Earth” last summer. Hard to watch the chases when the predators capture their prey, often a young one of whatever species that was separated from the herd. I watched the “Ice Worlds” episode last week, to finish off the DVD they left behind. It featured a polar bear who was not successful in his hunt, in part because of changes in the ice due to climate change. He made a last, desperate, effort to attack a walrus. When it failed, the starving bear laid down to die. Ouch! I asked Richard whether he would rather be predator or prey . . . we decided there is no obvious answer. Hi Sally! Good to hear from you. I am not familiar with Joseph Campbell, and will look him up. I appreciated the quote about the vegetarian! I always wanted to be a wildlife photographer as a little girl, faithful fan of the National Geographic Specials, but decided I couldn’t do it, because so often they film animals like that polar bear, or that young gazelle you mentioned. How could they simply film and not intervene?! And predator or prey? “Avatar” makes it seem so simple to be a predator. You just say “thank you” to the victim before dispatching it. But we both know, from watching National Geographic and Planet Earth, that it’s a lot messier than that. I think I’ll pass on both options, and choose to live in M. Night Shymalan’s “The Village.”. They live in lovely Shaker-style homes without telephones or computers. They eat the food that they raise, and are outside a lot. What’s that? Monsters in the wood’s edge? Completely worth it! Just stay near the gardens, and you have a nice life….